Access the Google doc through Drive here. MS Chowa Introduction – Personal Yearbook Page! Today we will learn the principles of effective page design by creating our own personal yearbook pages! You will need Adobe InDesign installed on your computer for this lesson. Step #1: Make sure to check the ladder to indicate which teams / pages you will be working on for the yearbook this year. Step #2: Access the following website to learn about the basics of page design. Then, have a look through our yearbooks from past years and evaluate them – how are we doing? Step #3: Start your own practice page! 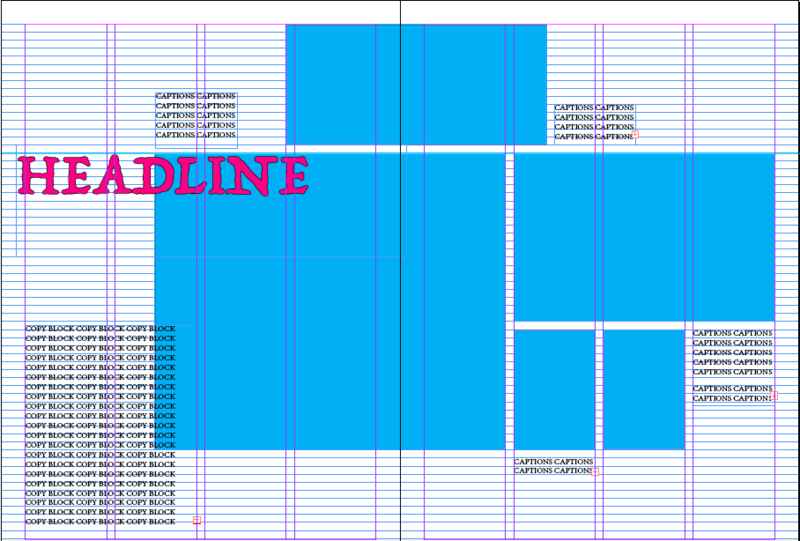 Download the InDesign template here. Make a folder on your desktop called ‘Yearbook’. In this folder, make another folder called ‘Practice Page’. Put your template into this folder. Gather some photographs about you to create a page with. It could be about you generally, about friends, hanging out, hobbies, sports, a recent holiday… Download these photos into your ‘Practice Page’ folder. Follow this guide to create a practice page, remembering to follow the 10 rules of design! created a double page spread? placed a central or ‘centr-y’ / dominant image (that stretches across both pages; it can be ‘offset’)? NOW YOU ARE READY TO START CREATING PAGES FOR THE YEARBOOK! Caption – The copy that explains the who, what, where, when, how and why of action in a photo; plan space for every photo to have a caption! Dominant element – The largest eye-catching photo or collection of photos or elements on a spread. Often this will ‘sit’ or ‘hang’ on the eye-line and sit across the gutter, providing unity to the spread. Internal margin – A consistent amount of white space between elements on a page; usually one pica. Copy – All the text on a spread – includes captions, headlines, stories. The copy tells the story of the year. Eye-line – A one pica horizontal line that connects the left and right pages. Usually this is about 1/3 or 2/3 the way down a page. All elements should either sit on top of or hang below this line. Bleed – When pictures or text extend right the way to the end of the page. Headline – Words set in large type that attracts the reader to a spread. Traditionally set above copy blocks. White space / negative space – The absence of any element. Gutter – The space where the left and right pages meet. Often one or two picas wide and folded as the book comes together. Pica – A journalistic unit of measurement, one pica=1/6 of an inch or 4.23 mm. We will also learn at the following design principles. Organise the pages – double page spread? Or single left? Single right? Use the following guides to design a layout for the page. Use shapes for photograph placeholders and text boxes for headings, captions and copy. Link to Google doc here. Today we will start building our rough printed portfolio for the yearbook, so we need to learn how to export our InDesign pages into PDFs. Follow this guide to find out how! As for error checking, this website has a useful tutorial on Live Preflight. It is quite detailed and not really necessary, but you might find it useful should you get stuck. The following document is also accessible through Google Drive here. Our yearbook theme this year is doodle. This means we should add some little touches to all our pages to keep the entire yearbook consistent. Today, we will play around with some different brushes in Photoshop. Go to this website and check out some of the brushes. Find a set that you like and download them. Then, get doodling! Draw something related to a recently completed page. Drop the file in the same working folder as your InDesign file (with all your other pictures). Then place the image using the ‘frame’ tool just like all the other images. Now that we have decided on our ladder, we need to determine who will cover what. A ‘beat’ is an area or topic that a reporter is assigned to cover – you will be assigned to cover a specific person, club, sport activity or event and it is your job to stay in contact with that person or people involved. It will also be up to you to find and generate the ‘stories’ of these activities as the year progresses. Look through the ladder and divide the pages. Think about which topics can be combined into a single beat. Then, think about how you could ‘cover’ the beat – Q+A, attend yourself etc… Put this into the ladder. Step 2 – Get Ready! Contact the captains and coaches of the sports teams and let them know you will be in contact with them for information. Tell them that you will be looking for interesting stories, scores for games, and anything else that can tell the ‘story’ of the event. Keep a record of all games, opposing teams and scores. Keep track of games and try to attend a game sometime. Contact the club adviser teacher and let them know that you will be in touch with them for information – you are trying to tell an interesting story of the activity! Read some example stories and see what sort of information you need to gather. Grab a ‘reporter’s notebook’ and plan your first visit. Go out and get the scoop!